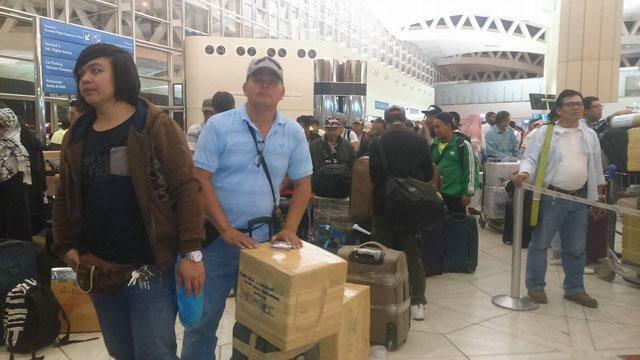 Published September 4, 2016 12:51pm RIYADH —Another batch of retrenched OFWs from Saudi Arabia are on their way to Manila, a Philippine Embassy official said Sunday. First Secretary and Consul General Iric Arribas in Riyadh told GMA News Online that 118 OFWs who used to work in Saudi Oger Company left for Manila on a Saudia Airlines flight. A batch of 118 retrenched OFWs from the Saudi Oger Company await their flight to Manila in this September 4, 2016 photo taken at the Riyadh International Airport. Expected arrival of the repatriates at the Ninoy Aquino International Airport Terminal 1 is at 4 p.m. Sunday in Manila, the the Philippine foreign official said. To ensure a hassle-free departute, the group was accompanied and assisted to the King Khalid International Airport by the Philippine Embassy and POLO-OWWA Officials headed by Arribas. The 118 OFWs are among the thousands of retrenched Filipinos in the Kingdom of Saudi Arabia (KSA) amid the Saudization policy and the a slump in the prices of fuel in the oil-producing Middle East. Arribas said the airfare was paid for by the Saudi government as part of its pledge to provide free flights to Manila.